So you have tried out a few boats in the starter price range. You have decided that you like RC boating, and you want to upgrade to a better boat. The problem is, you have no idea what to get. The $100 to $200 price range is where RC boats start to get really fun. At less than $100, most boats are of cheap quality, handle poorly, and worst of all SLOW. But it can be difficult trying to choose a boat in this price range, as the stakes are higher. If you make a poor choice and get a boat that you are not happy with, you will be out a lot of money. That is why we put together this list of boats that we think are the best in this price range. We looked at dozens of boats in this category and compared prices, features, and even customer reviews. 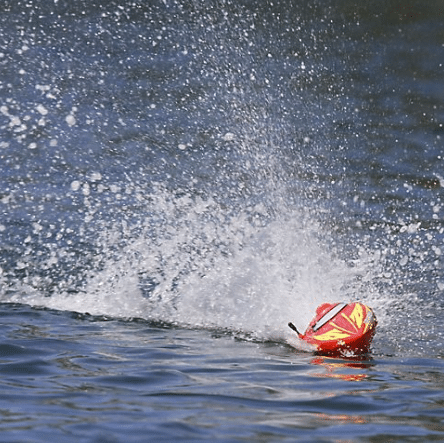 The list we curated has the best RC boats on the market in this price range. We are confident that you will be happy with any of the boats we chose. We hope that you will find this list helpful, and enjoy your brand new boat! 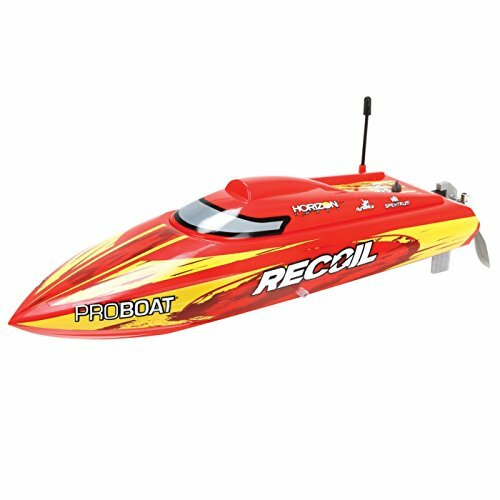 Our top choice for the best RC boat under $200 is the Pro Boat Recoil. This boat simply blows all of the other boats out of the water. From the high speed, to the feature packed design, this truly is a quality ship. The Recoil is built with a water-cooled, brushless motor that powers this boat to speeds of 25+ MPH. Speeds like that are hard to find on boats this size. Cruising along at those speeds really makes RC boating fun. If you are racing your friends’ boats with it, they don’t stand a chance. There is nothing worse than having to go recover your boat from the middle of the pond because it flipped over. It is also no fun holding back hitting top speeds for fear of tipping the boat over. Well, say goodbye to those problems, because the Pro Boat Recoil is built with a self-correcting hull system. That means no more swimming into the lake to retrieve your boat, and no more going slow. It is also good to know that you don’t have to worry about replacing this boat for a long time. It is built with quality materials, including an aluminum rudder. All this is great, but what is even better is it can be had at an amazing price. The 2nd best boat in the under $200 price range is the Stealthwake, which is also made by Pro Boat. Clearly Pro Boat makes a good product, and the Stealthwake is no exception. Although the Recoil and the Stealthwake are very similar, there are some major differences between them. For example, the Stealthwake is powered by a brushed motor. Another major difference to note is the length. This boat is 23 inches long, while the Recoil was 27 inches. The motor on the Stealthwake is a water-cooled 550, providing ample power for zooming around on the water. The battery is a 7.2V 2400mAh NiMH battery that lasts about 10 minutes of hard use on the water in between charges. The boat also comes with the stand pictured above, so you can mount it and show it off when it is not in use. 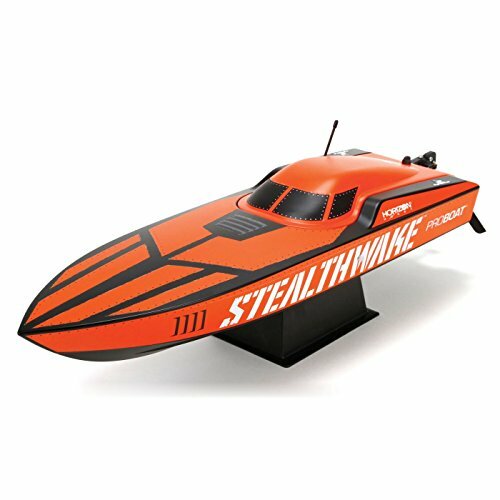 The Stealthwake RC boat is made of durable ABS plastic construction. The boat also handles like a dream, being able to turn on a dime. This would make a great boat for racing where sharp turns are required. 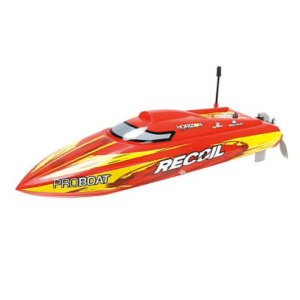 Although this RC boat does not have as good specs as the Recoil, its lower price makes up for it. 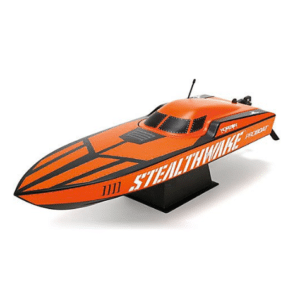 Pro Boat Stealthwake Deep-V Brushed RTR Vehicle, 23"
The last boat in our list of the best RC boats under $200 is the Feilun FT012. Even though it is the last on our list, the FT012 is by no means a bad boat. As a matter of fact, it is one of the best-selling boats in this price range. We should start this off by saying that this boat has a top speed of around 28 MPH, which is insanely fast. Not many other boats in this price range are capable of reaching this speed. If you can learn how to handle it, racing with this boat almost guarantees a win. The RC receiver has a range of 450 feet, meaning that you will really be able to take advantage of that amazing speed. 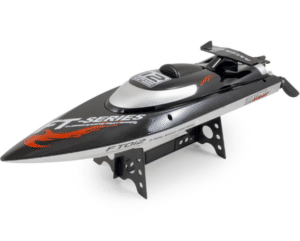 The FT012 is just over 18 inches long, and comes with a self-adjusting hull feature that will keep the boat from flipping over and getting stuck. The boat is powered by a water-cooled, brushless motor, which is also a nice touch. The run time is about 10 minutes, which is pretty standard for boats in this range. The Feilun FT012 is a great quality boat, that is loads of fun. It is not the absolute best boat money can buy, but it is by far the least expensive RC boat in this list. Remote control type :2.4G，Channel number :4CH,Remote Control Distance(Meters) :100-150M；for using effect, please research "feilun FT012" in youtube"
Flip over automatically and quickly when the boat is capsized, easy to operate,Highly cost-effective 3 in 1 Electronic Speed Controller, with 2.4G receiver,electron speed regulator and servo controller.v 5. Electronic Speed Control system has been designed with protection to avoid damage from overcurrent,overvoltage,Low voltage,motor blocked,etc. 1. Most of the boats are not ready to use out of the box. As with most boats in this price range, you will need to charge up the battery, and seal the hull with tape. As well, some boats will not start the motor until they are in the water. 2. There are a few items that you should probably purchase along with the boat. The first item is quality grease, which will keep things running smoothly in the boat for years to come. The second thing to get is waterproof hatch tape, that will keep the boat from leaking water. We hope that you found the information in this review useful. 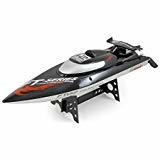 If you decide you would like an RC boat in a different price range, be sure to check out our other reviews.